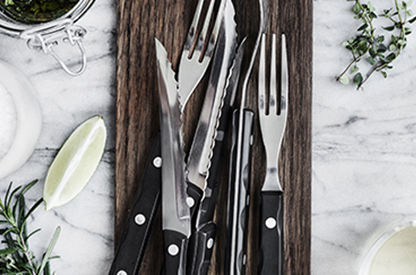 For more than a century, Gense has been one of the leading providers of cutlery in Scandinavia. Combining design and functionality, the Swedish-founded company has been passed through the hands of generation after generation. While most companies producing cutlery today do so as part of a larger production of interior design and kitchenware items, Gense has retained a firm focus on cutlery production. In doing so, the company has gained not only a wide customer base across Scandinavia, but also the title of Purveyor to the Royal Court of Sweden. Another newer addition to the market is coated cutlery, which allows buyers to choose a cutlery that stands out not just in design and quality, but in colour as well. “We were some of the first ones out with a black coated cutlery in 2012, but back then, actually, people weren’t quite ready. So it took a couple of years before we started selling, and then the rest of the market quickly followed,” says Hansen. Indeed, while cutlery has, admittedly, not gone through radical changes through the last century, small innovations, quality designs, and a constant presence have ensured that Gense has continued to be passed through the hands of generation after generation.